Bud was born March 19, 1929 in the town of Tilden, the son of Bernard and Ida (Rubenzer) Zwiefelhofer. On November 8, 1958, Bud married Agnes Hable at St. Paul’s Catholic Church in Bloomer. 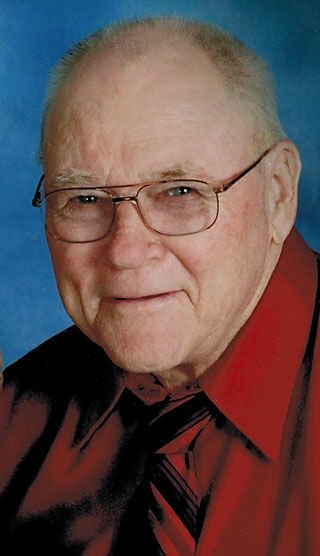 He was a lifelong farmer in the town of Cooks Valley. Bud enjoyed bowling, playing ball, golfing, umpiring ball and polka dancing in his younger years. Many wonderful memories were made traveling with friends. He also enjoyed fishing and playing cards. Card games were always a must, with Sheepshead being his favorite. His goal was to live until 90, and he still played Sheepshead the day after his 90th birthday. In addition to all of the above, he loved to watch “I Love Lucy” at 3 a.m. and “Mollie B”. He was a fun-loving guy and had a joke to share with everyone. Bud is survived by his wife, Agnes of 60 years; children, Diane (Chuck) Seibel of Bloomer, Alan of Bullhead City, Arizona, Kevin “Curly” (Donna) of Bloomer, and Loran (Darlene) of Bloomer; five grandchildren, Adam (Chrissy) Seibel, Justin Seibel (Nikki Anderson), and Nicole (Aaron) Hoverson, Emily and Nolan Zwiefelhofer; one step grandchild, Sara (Chad) Bucholz. Additional survivors are two great-grandchildren, Claire and Garrett Seibel; two step great-grandchildren, Tyler and Reeve Bucholz; brother-in-law, Robert Wiensch; sister-in-laws, Jeanne Hable and Theresa (Dennis) Hickethier. Bernard was preceded in death by his parents; step-father, Eugene Stoffel; brother, Donald Zwiefelhofer; sister-in-law, Joan Wiensch and brother-in-law, John Hable. Memorial Mass of Christian Burial will be held at 10:30 a.m. on Wednesday, April 17, 2019, at St. John the Baptist Catholic Church in Cooks Valley. Burial will take place in the church cemetery. Visitation will be held from 4-7 p.m. Tuesday, April 16, 2019, at Thompson Funeral Home & Chippewa Valley Cremation Services in Bloomer and one hour prior to the Mass at church on Wednesday. A Christian Vigil service is at 7 p.m. Tuesday at the funeral home. In lieu of flowers, donations can be made to St. John’s Parish in Cooks Valley and Mayo Clinic Home Health & Hospice Care. Thompson Funeral Home & Chippewa Valley Cremation Services in Bloomer is serving the family. To offer online condolences please visit, www.thompsonfuneral home.com.